MISSILE-throwing continues to taint the face of Zimbabwean football with the latest case being at the Castle Lager Premier Soccer League match (PSL) between Dynamos and Yadah a fortnight ago at Rufaro Stadium. Fans in the terraces have various ways of expressing dislike over what is happening on the field of play. Whistling is one of them, but now they have gone to the extend of throwing whatever they can onto the pitch. Bottles, fruits, stones in some instances and metal cans find their way onto the pitch from disgruntled fans. In some instances, hooligans smuggle catapults, knobkerries and other weapons into stadia. There are teams with fans known for such wayward behaviour. The league’s most followed teams — Highlanders and Dynamos — have always had problems with their league of fans. The thrown missiles either harm or injure soccer players or match officials as fans pelt whosoever they believe would have evoked their displeasure. Goalkeepers are not spared missile attacks as goalposts are nearer to the terraces. Match officials too have their fair share, especially the assistant referees, popularly known as ‘linesmen’ who have been pelted with all sorts of objects. Mineral water bottles, soft drinks and beer cans smuggled and sold by vendors in the stadium often find their way onto the pitch once fans are disgruntled. Some missiles containing urine are also thrown on the field of play. Authorities banned bottled drinks for fear of them being used as weapons as only beverages in plastics or cans are allowed into the stadium, however bottles still find their way in. Authorities need to nip this in the bud. Highlanders, Dynamos, CAPS United and at times Shabanie Mine have had a series of crowd trouble resulting in some matches being abandoned. Banning the sale or entry of any bottled beverages in stadia might be one of the solutions as punishing the clubs has not been effective. Maybe the fines imposed are not punitive enough. 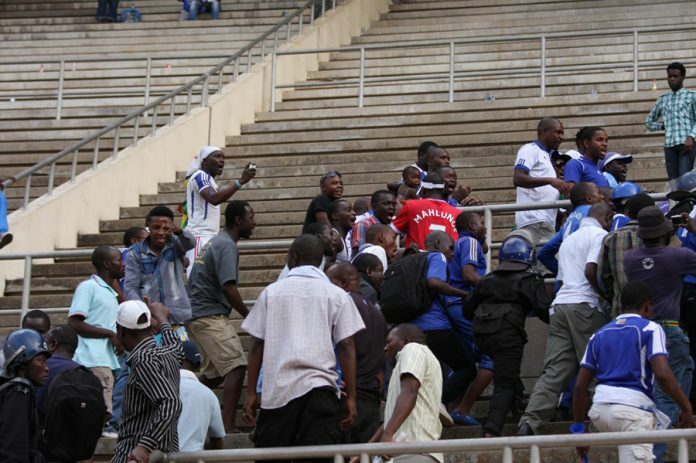 Highlanders and Dynamos, in particular, have been fined several times for crowd trouble. In September 2014, Highlanders fans threw missiles at ZPC Kariba players at Hartsfield Stadium in Bulawayo. The fans had been disgruntled by their team’s 1-3 loss to title debutants ZPC Kariba. Players from both teams had to rush to the centre circle for cover where missiles could not reach. The police had to intervene to disperse the angry fans. At the end of the season, Highlanders had fines garnished from their prize money by the PSL. In 2016, the country’s two most followed clubs were also sanctioned to play in empty stadia. Highlanders fans, in August 2016, caused mayhem after a 1-1 draw with Chicken Inn at Barbourfields Stadium alleging poor handling of the match by referee Nkosikhona Moyo had cost them. The fans invaded the pitch and fought running battles with police. The PSL fined the club US$3 500 and were ordered to play their next home match in an empty stadium. The club protested, arguing they would lose out since gate takings also funded the club’s operations. In the same year, Dynamos fans took the law into their own hands and scaled the perimeter fence at Rufaro Stadium after losing 0-1 to FC Platinum. Running battles ensued before police had to use teargas to disperse the mob. After being found guilty, the Harare giants were ordered to play their next home match against Ngezi Platinum Stars in an empty stadium again. Zvishavane’s oldest club, Shabanie Mine, has similar problems of crowd trouble. They have been involved in ugly scenes of missiles and post-match violence. At one time, the Shabanie Mine fans clashed with Highlanders supporters and several were injured. Although the PSL penalises clubs, the behaviour by fans is still appalling. Each year, teams are losing potential revenue through their rowdy fans. The Dynamos incident a fortnight ago had two parties to blame – the police and Dynamos fans. The PSL last week communicated they were waiting for an official report from the police on what really transpired at Rufaro Stadium. A police officer near the Vietnam Bay mistakenly fired a teargas canister resulting in commotion in the terraces. Fans had to scale the perimeter fence onto the field of play during halftime to avoid the teargas and after normalcy returned, the match restarted. It was the Dynamos fans again who decided to pelt Yadah goalie Stephen Chimusoro whom they alleged was time wasting. The goalkeeper, who was in the Mbare end posts, was pelted with missiles, in the process, forcing some match stoppages. Dynamos were trailing Yadah 0-1 courtesy of a fourth minute goal by Leeroy Mavhunga. The fans thought the Yadah shot-stopper was faking injuries, but it seems Dynamos will pay a fine because their fans continuously threw missiles onto the pitch. It may be prudent this season for the PSL to take stern measures not only on teams, but identify the fans who throw missiles on the field of play and either fine or ban them from matches. The police and stewards at the matches are supposed to be discharging their duties facing the crowd instead of following action on the pitch. That aspect must be seriously looked into considering that they only attend to the fans in the terraces when there is trouble.